I threw off two quilts and a down comforter this morning, and leapt to my feet. Hurriedly I dressed into chore clothes and padded stockinged-footed downstairs to make coffee. The dogs sleepily rose from their beds to gather their morning pats before groggily making their way outside for the day’s first potty trip. The damp March air filled my lungs with both the early smells of earth’s warming and of clouds holding snow. We in northeastern Pennsylvania still sit on the edge of spring, with wintry conditions hovering. I whistled the dogs back inside. They listened impatiently as the kibble clinked into their bowls, paused in their down positions before being released with my “Rise and shine” command. As Cappy, Fly and Luci wolfed down their breakfast my coffee steeped; finally I pushed the plunger of the French Press, and poured a mug of strong, bold brew lightened with a generous slug of cream. The house was empty and still, NPR talking in the background, the computer screen an eerie glow in the dawn lit kitchen just waiting to transmit the bits and bytes from my trans-Atlantic children. 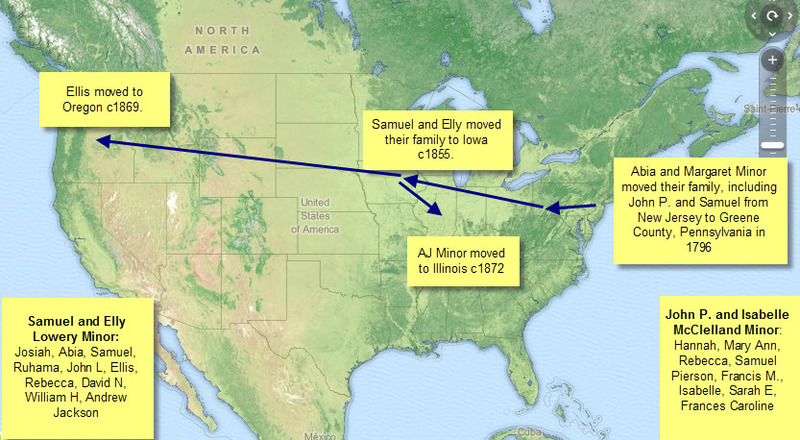 How different was the dawn for my great-great-great-grandmother, Isabelle McClelland Minor. When Isabelle was my age, she had five grown kids, married with children of their own; and five kids still living at home, the youngest just 11 years old. Her wake up time would not have been so peaceful or languid, and her breakfast chores would certainly have required more effort than pouring kibble into a bowl. On the morning in 1855 that she and John P finally gave the Harrison County, Virginia land over to eldest son Abia Minor, Isabelle probably finished a bunch of chores by the time light broke over the farm in Greene County, Pennsylvania. Hopefully the May air was sweet with the smells of a first cut of hay and with the endless song of birds waking to feed nestlings. Did Isabelle feel satisfied to be off the farm for the day? How much say did she have about this transaction? Was she pleased to make this provision for her eldest boy’s family? 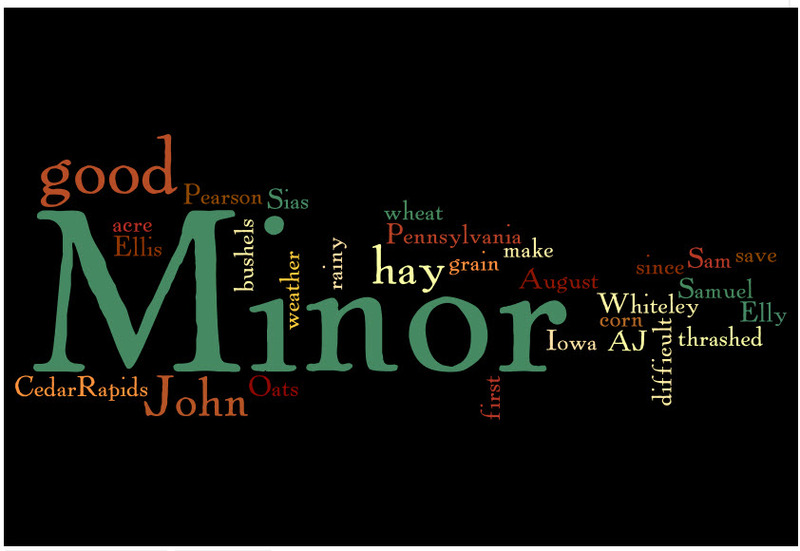 The land on which Abia Minor farmed from the mid-1840s through the 1850s. 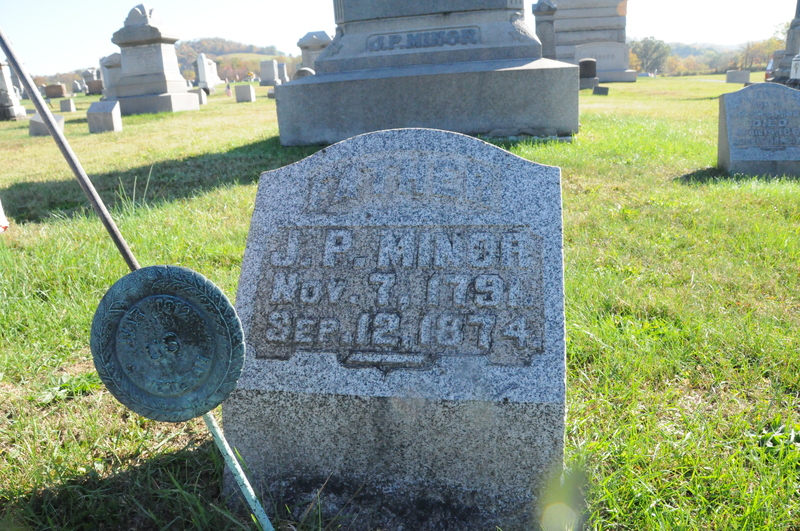 Abia Minor, for his part, had lived on the Harrison County farm since at least 1845, and had six children by 1853, the year he lost his wife, Elizabeth. 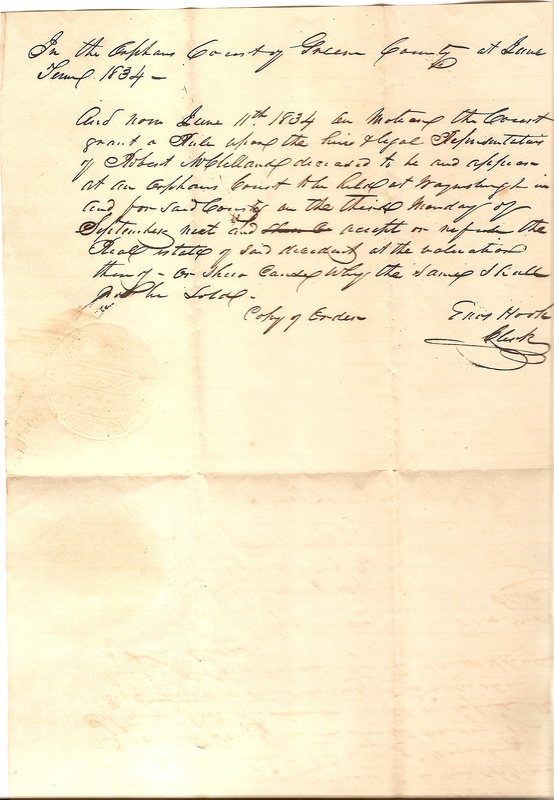 He had remarried, taking Hannah Ballard as his wife, only four months before his parents went to James Cree and Alexander Stephenson to draw up this document. At almost forty years of age, Abia must have felt that this Minor detail was long overdue. This Indenture made the Eleventh day of May in the year of our Lord one thousand Eight Hundred and fifty five Between John P Minor of Green County and State of Pennsylvania and Isabel His wife of the one part and Abiah Minor of Harrison County and State of Virginia of the other part Witnesseth that the said John P Minor and Isabel his wife for and in consideration of his share of a tract of Land willed to him the said Abiah Minor by Robert Mc Clelland deceased it being valued at twelve Hundred dollars the receipt whereof is hereby acknoledged (sic) and for other reasons and in Liew of Legacy*¹ do Hereby grant bargain sell convey and confirm unto the said Abiah Minor his heirs and assignee for Ever all that tract or parcel of Land situate lying and being in the County of Harison (sic) in the State of Virginia and bounded as follows Beginning at a Shugartree (sic) and of the original Corners of the Lowther Survey also a Corner to Land belonging to Solomon Holland thense (sic) by Lands of Said Holland North 81 E 22 perches to a corner thense (sic) south by Land of Same 28 E 76 perches to a corner on the creek thense (sic) up said creek 13 ¼ perches to a corner thense (sic) North 25 ½ E54 perches to a post on the division line between Abia Minor and Robert Minor thense (sic) North 20 ¾ E 90 perches to a stake on said line thense (sic) by the same Course 66½ perches to a Stone near to a whiteoak thense (sic) on a Northern direction to a stone on the original Line 162 ½ perches thense (sic) South 27 W 53 ½ perches to a Stone in the old line thense (sic) South 10 West 11 perches and 15 links to a Black oak Near to a Cole (sic) Bank thense (sic) South 16¾ East 96½ perches to a Beech thense (sic) South 8½ West 28¼ to a whiteoak thense (sic) South 12 W26½ perches to a Stake near the mouth of the run*² thense (sic) S 10 W 24 perches to a sugar tree place of beginning containing one Hundred and sixty acres, it being a part of a sirvey (sic) of Land Deeded to the party of the first part by deeds of James P Wilson bairing (sic) dates 19th october 1841 and 31st March 1842 and recorded in Book No 29 folio 486 and in deed Book No 29 folio 681 in Harison (sic) county State of Virginia as Shown by the cirtificate (sic) of the Clerk of Said county Referance thereunto being had will more fully appear together with all and singular other the the houses out houses buildings barns stables ways roads waters water courses rights libertys priviledges hereditaments and appertenances whatsoever thereunto belonging or in anywise appertaining (Except the wright (sic) of a way for the benafit (sic)of the upper or remaining part of the aforesaid Survey to get out to the road.) and the reversion and remainders rents issues and proppert? ?thereof and also all the Estate right title interest property clause and demand whatsoever of them the said John P Minor and Isabel his wife in law with equity or other wis however of in to or out of the same To have and to hold the said (several words unreadable) containing one hundred and sixty acres hereditaments and premises hereby granted or intended so to be with the appertenances unto the said Abia Minor his heirs and assigns to the only proper use and behoof of the said Abiah Minor his heirs and assigns for ever and the said John P mInor and Isabel his wife do covenant and agree to the said Abiah Minor to warant (sic) and forever defend from all persons Lawfully claims rising under them interest or title to the aforesaid premises In witness whereof the Said John P Minor and Isabel his wife have hereunto set their hands and seals this day and year first above written. *¹Abia did not receive any other land or money in the settlement of John P. Minor’s estate. 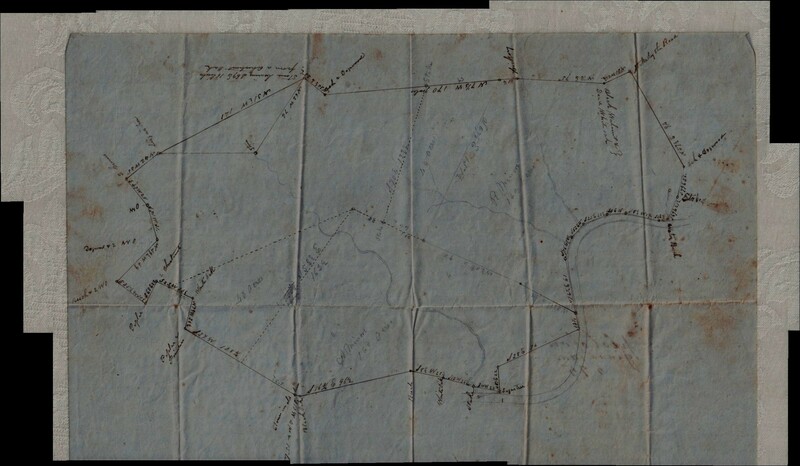 *² The run mentioned in this document refers to what is known in the 1841 and 1842 documents as Limestone Run, which emptied into Simpsons Creek.